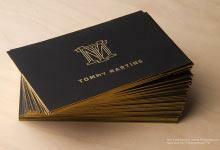 Spot color is a specialized type of printing with which we can apply solid, brilliant color to our metal cards. Spot color can be applied to either etched or un-etched surface and can be color matched by using pantone reference codes. 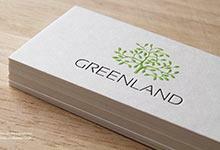 Spot color is the ideal way to incorporate your branding colors into your metal card design. 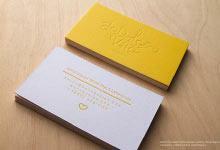 Full bleed spot color can even be used to color an entire side of a card to match your design. We recommend using spot color for contact information especially on our black metal business cards to increase legibility. Spot color is also available for use as variable data! Multiple spot colors can be used in close proximity to one another however they can only be printed in the following ways: A 1mm thick buffer zone of un-etched material must be present between the colors or, the spot colors must not be applied with etching. Spot color may not be able to produce highly fine, and detailed designs. Please email our sales team if you would like your design assessed for feasibility.